Are you looking for a promo with longer validity at a very affordable price? We have something new to share for all you that you need to check out. I’m surprised with the message that I received about my Globe favorite about the new prepaid GoSAKTO GOTSCOMBODD 70 promo. The 7 days 1GB internet surfing for 70 pesos and 1000 free texts to Globe and TM now comes with unlimited texts to all networks. It becomes more affordable to those who love to go online and often texts their love ones on different networks. “Surprise! Ang dati mong 1000 texts to Globe and TM, ngayon, Unli Allnet Texts na! Enjoy it as long as you are registered to GOTSCOMBODD70 valid for 7 days.” Super cool right? If you’re interested to avail this promo you can check out the mechanics below. Update: Also known as GOSAKTO 70. 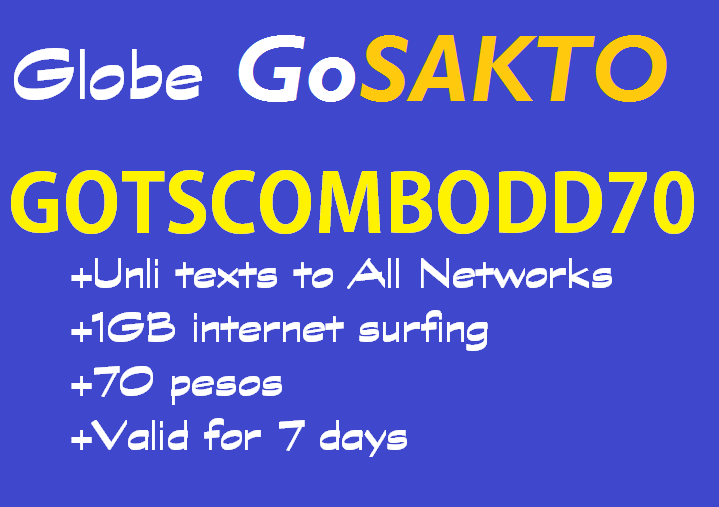 To subscribe, simply text GOTSCOMBODD70 or GOSAKTO70 to 8080. 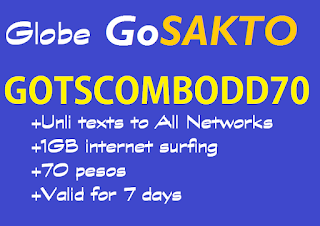 There's a new 7 days promo called Globe GOTSCOMBODD90 – offers 2GB Data + Unli SMS to All Networks for only 90 pesos. You can also register this promo via USSD *143# menu on your Globe mobile phone. Just select GoSAKTO and create your own promo, choose text and surf then make sure to follow options correctly. To stop this promo, just follow steps on how to Stop Globe Promo for you to register to another GoSakto offer. Since this is a GoSAKTO promo, it includes FREE Facebook while you register to this promo. Just text FREE FB to 8080 to avail. To check your remain MB/GB surfing balance you can text GOSAKTO STATUS then send to 8080 and wait for SMS notifications regarding your promo balance. Gumagana pa po ba ito ? Can TM users can subscribe to this promo? May access ba to sa Skype? Any TM user confirm if this works? Pano mag register if para sa pocket wifi? same lang.Or you may open 192.168.254.254 address. Question lng sa 1g INternet does it mean na pag naubos ung 1g sa loob ng 1 day babagal na ung net or mwawala na? o everyday may 1g ka nag rerefresh every 24hrs katulad sa srufmax? yong 1G na data ay consumable yan for 7 days, pag naubos mo 1G w/in 1 day ay d ka na mkk browse, pero yong unli txt ay pwede pa sa loob ng 1 linggo. Sa TM po ba nagana? please how to get the balance of net usage?? Our system has detected that multiple promo registrations were sent from your account. With this, the system automatically disallowed you from registering to this service. You may try our other promos instead by dialing *143#. To be guided in using our unlimited promos, please visit www.globe.com.ph and check our Acceptable Terms on Fair Use. jan 30 ako nag register 70 pesos..
meron pa bang promo na ganito? bawal pu ito sa tm? FB is no longer free. Why? Literal na free data without pictures unlike before. gumagana ba ito sa globe postpaid subscribers? Gumagana pa din po ba to ung free fb?? Pwede po ba ito sa globe prepaid home wifi?? ?